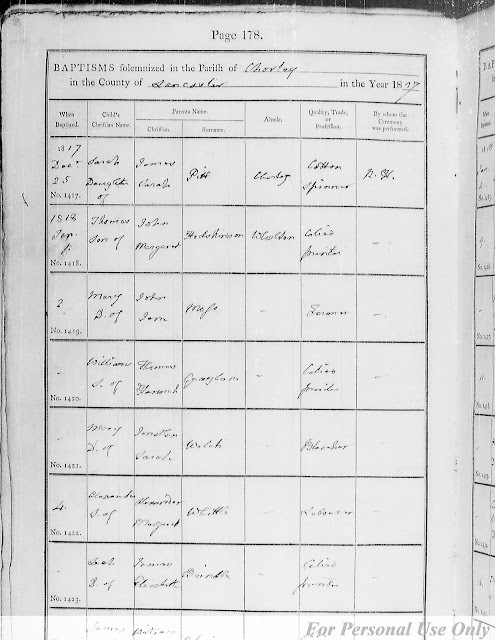 This week's Tuesday's Treasure is the 1818 baptism record for Alexander Whittle (1818-1853) in Chorley, Lancashire. It's not clear if the abode was Chorley or Wheldon or perhaps some other place. St. Laurence (Chorley, Lancashire), Births, baptisms, marriages, burials, 1653-1821, page 178, Baptisms; FHL BRITISH Microfilm 93,703, No. 1422, baptism of Alexander Whittle, 1818. Alexander Whittle was the 11th child of 12 born to Alexander Whittle and Margaret Mansley in Chorley, Lancashire. He married Rachel Morley in 1840 in Bolton-le-Moors, Lancashire, then they sailed for Australia. Their daughter, Jane Whittle (1847-1921), married Elijah McKnew in 1865 in California. Alexander and Rachel (Morley) Whittle are my wife's second great-grandparents.